The Inter-Continental Hotel Phnom Penh offers the discerning traveler the ultimate in comfort and hospitality. The hotel provides the highest standard of accommodation and service identified as the hallmark of the worldwide Inter-Continental Hotel Group. Whether visiting Cambodia on business or coming to experience the unique history and culture of the Khmer people, the Inter-Continental can help make your visit a memorable experience. The Hotel is located in Regency Square, a new development area of Phnom Penh, and only 15 minutes from Pochentog International Airport. 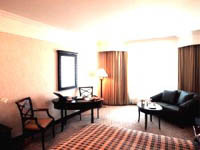 The Inter-Continental Hotels offers a full range of dining and entertainment facilities. Guests can relax at the outdoor swimming pool, work out in the state of the art health and fitness center or dine in style at one of the hotel's top class restaurants. The Business Center in the hotel can give business travellers a head start in any business negotiation in Cambodia. All the latest computer and communication facilities are provided along with local secretarial services, meeting rooms and presentation services. Banquet and function facilities are also available. The exclusive Club Inter-Continental has 64 rooms over two floors giving members access to all the usual benefits of membership. Add : 30 Hang Be St, Hanoi, Vietnam.